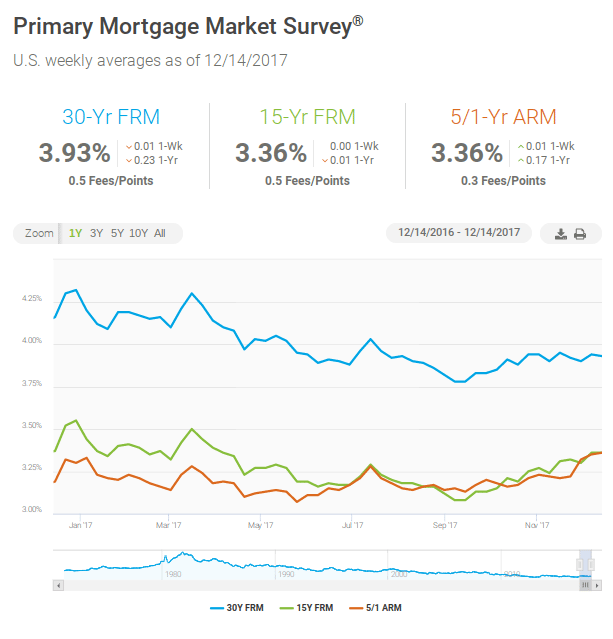 30-year fixed-rate mortgage (FRM) averaged 3.93 percent with an average 0.5 point for the week ending December 14, 2017, down from last week when it averaged 3.94 percent. A year ago at this time, the 30-year FRM averaged 4.16 percent. 15-year FRM this week averaged 3.36 percent with an average 0.5 point, the same as last week. A year ago at this time, the 15-year FRM averaged 3.37 percent. 5-year Treasury-indexed hybrid adjustable-rate mortgage (ARM) averaged 3.36 percent this week with an average 0.3 point, up from last week when it averaged 3.35 percent. A year ago at this time, the 5-year ARM averaged 3.19 percent. “As widely expected, the Fed increased the federal funds target rate this week for the third time in 2017,” said Len Kiefer, deputy chief economist at Freddie Mac. “The market had already priced in the rate hike so long term interest rates, including mortgage rates hardly moved. The Market Composite Index, a measure of mortgage loan application volume, decreased 2.3 percent on a seasonally adjusted basis from one week earlier. On an unadjusted basis, the Index decreased 4 percent compared with the previous week. The Refinance Index decreased 3 percent from the previous week. The seasonally adjusted Purchase Index decreased 1 percent from one week earlier. The unadjusted Purchase Index decreased 6 percent compared with the previous week and was 10 percent higher than the same week one year ago. The refinance share of mortgage activity increased to 52.4 percent of total applications, its highest level since January 2017, from 51.6 percent the previous week. The adjustable-rate mortgage (ARM) share of activity decreased to 5.6 percent of total applications. The FHA share of total applications increased to 11.8 percent from 11.1 percent the week prior. The VA share of total applications decreased to 10.3 percent from 10.7 percent the week prior. The USDA share of total applications decreased to 0.7 percent from 0.8 percent the week prior. The average contract interest rate for 30-year fixed-rate mortgages with conforming loan balances ($424,100 or less) increased to 4.20 percent from 4.19 percent, with points decreasing to 0.39 from 0.40 (including the origination fee) for 80 percent loan-to-value ratio (LTV) loans. The average contract interest rate for 30-year fixed-rate mortgages with jumbo loan balances (greater than $424,100) decreased to 4.11 percent from 4.16 percent, with points unchanged at 0.28 (including the origination fee) for 80 percent LTV loans. The average contract interest rate for 30-year fixed-rate mortgages backed by the FHA increased to its highest level since April 2017, 4.13 percent, from 4.11 percent, with points decreasing to 0.39 from 0.40 (including the origination fee) for 80 percent LTV loans. The average contract interest rate for 15-year fixed-rate mortgages increased to its highest level since March 2017, 3.61 percent, from 3.59 percent, with points decreasing to 0.44 from 0.48 (including the origination fee) for 80 percent LTV loans. Single-family rental boom lowered annual home sales by 270,000 homes. Across the United States, starter homes are slightly more likely than more valuable homes are to be rented out. After steadily increasing over the past decade, the share of single-family homes that are rented edged slightly lower to 18.9 percent in early 2017, down from a high of 19.2 in 2016. Rental houses purchased in recent years are more likely to be affordable starter homes than those purchased before 2006. 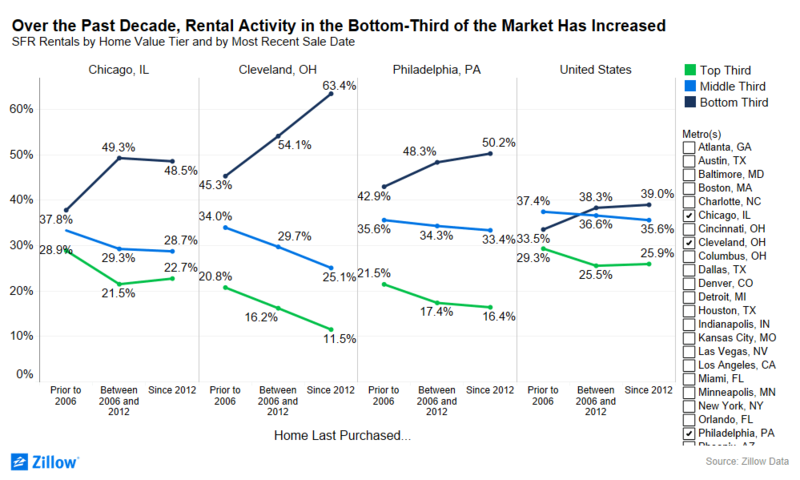 Over the past decade, rental activity in the bottom-third of the market has increased. 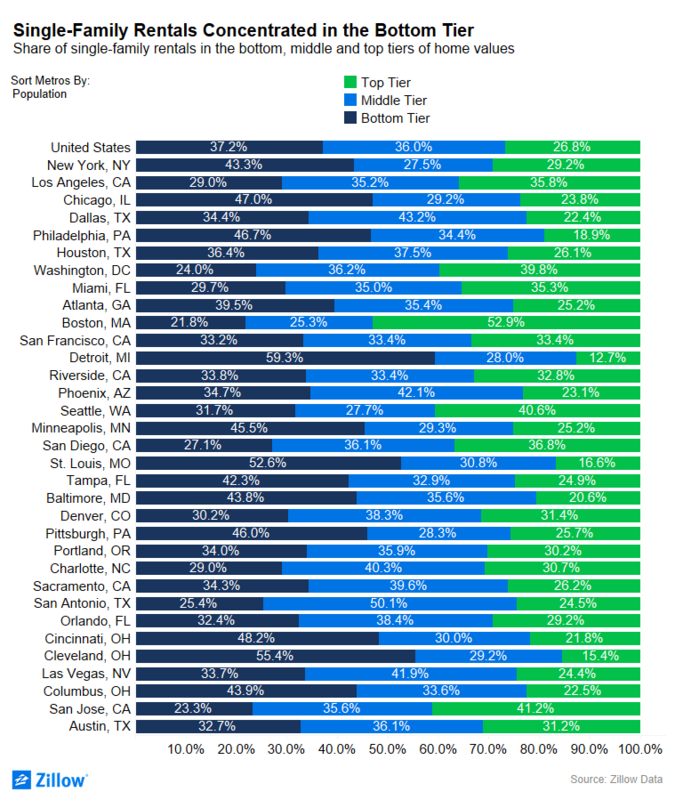 Comparing single-family rentals by when they were last sold, 39 percent of SFR rentals purchased by their owner since 2012 are in the bottom third of the market, compared to 33.5 percent of single-family rentals last sold prior to 2006. 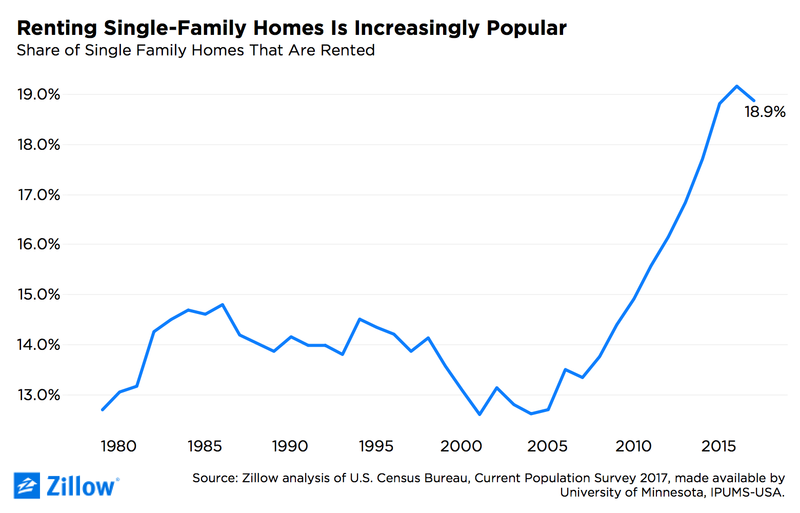 “For the past 10 years, the number of single-family homes that are rented has grown steadily and remains near the highest levels ever recorded,” said Zillow senior economist Aaron Terrazas. “The combination of foreclosures and growing rental demand following the housing crash was an attractive opportunity for investors — large and small — who were able to buy foreclosed homes and use them to meet the rental demand. At the same time, many long-time owners have opted to hold onto their homes as rentals even after they decide to move somewhere else. Mortgage applications for new home purchases increased 12.2 percent compared to November 2016. Compared to October 2017, applications decreased by 6 percent relative to the previous month. This change does not include any adjustment for typical seasonal patterns. The seasonally adjusted estimate for November is an increase of 0.6 percent from the October pace of 659,000 units. On an unadjusted basis, the MBA estimates that there were 47,000 new home sales in November 2017, a decrease of 11.3 percent from 53,000 new home sales in October. By product type, conventional loans composed 71.4 percent of loan applications, FHA loans composed 15.2 percent, RHS/USDA loans composed 1.1 percent and VA loans composed 12.3 percent. The average loan size of new homes decreased from $339,534 in October to $337,427 in November. “New homes sales continued to recover in November from the impact of hurricanes, up just a bit on a seasonally adjusted basis over the month, and nearly 13 percent higher than a year ago, according to our projections from monthly application activity,” said Lynn Fisher, MBA vice president of research and economics. Single family homes and condos flipped in the third quarter yielded an average gross flipping profit of $66,448 per flip, representing an average 47.7 percent return on investment for flippers — down from 48.7 percent in the previous quarter and down from 51.2 percent in Q3 2016 to the lowest average gross flipping ROI since Q2 2015. The report also shows that 48,685 single family homes and condos were flipped nationwide in the third quarter, a home flipping rate of 5.1 percent — down from 5.6 percent in the previous quarter and unchanged from a year ago. Year-to-date through the third quarter of 2017 a total of 153,727 single family homes and condos nationwide have been flipped, nearly equal with the 153,854 flipped through the first three quarters of 2016, when the number of homes flipped increased to a 10-year high. 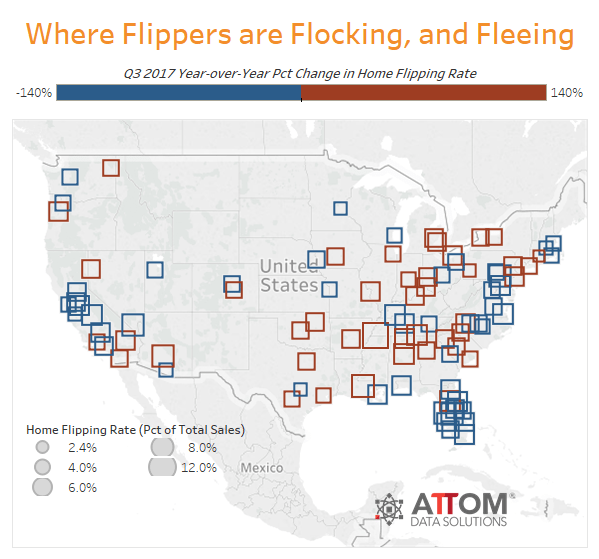 “Home flipping profits continue to be squeezed by a dwindling inventory of distressed properties available to purchase at a discount and increasing competition from fair-weather home flippers often willing to operate on thinner margins,” said Daren Blomquist, senior vice president at ATTOM Data Solutions. Fannie Mae’s 2017 Home Purchase Sentiment Index (HPSI) increased in November by 2.6 points to 87.8. 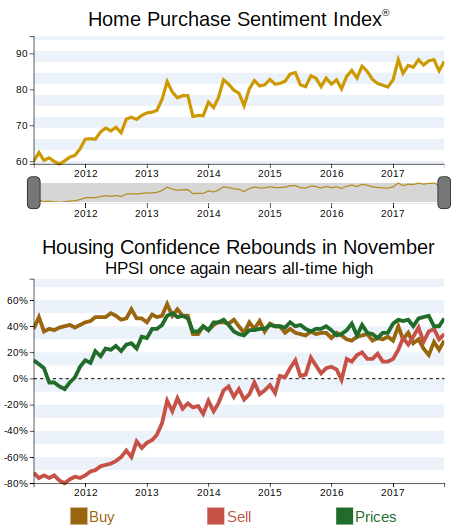 The HPSI is up 6.6 points compared with the same time last year. The net share of Americans who say it is a good time to buy a home increased 7 percentage points to 29 percent, erasing last month’s 6 percentage point drop. The net percentage of those who say it is a good time to sell a home increased by 4 percentage points to 34 percent. The net share of Americans who say that home prices will go up rose 6 percentage points to 46 percent in November. The net share of those who say mortgage rates will go down over the next 12 months fell 5 percentage point to -51 percent. The net share of Americans who say they are not concerned about losing their job rose by 4 percentage points to 74 percent. The net share of Americans who say their household income is significantly higher than it was 12 months ago remained unchanged at 14 percent.